There is nothing more dangerous and more likely to cut you than a blunt knife, at the same time most home sharpeners actually destroy your knives. It may seem like you are giving the blade a fine edge but in reality you are tearing it to pieces. A well-made knife is a long-term investment for many people, and, whether you are in the kitchen, fishing or hunting, you want to protect that blade for as long as possible. 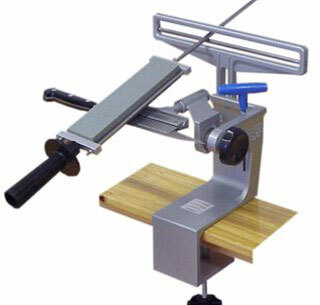 Using normal home sharpening systems often tear, shred and maul the fine edge of a knife. I charge a flat rate of R30 per knife.